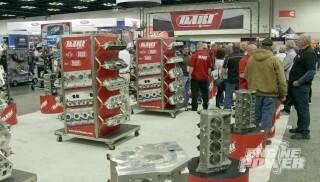 (MIKE)>> WHEN IT COMES DOWN TO IT WE'RE NORMAL GEARHEADS JUST LIKE ALL OF YOU. NOW IN THE SHOP TODAY WE'RE GONNA BE ASSEMBLING AN ENGINE THAT YOU'VE EITHER HEARD OR SEEN A LOT ABOUT. PLUS WE'RE TAKING OLE GRAY HAIR, WHITE KNUCKLE OUT TO THE TRACK. 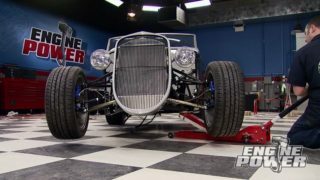 NOW THE PREMISE FOR THIS BUILD IS GEARED TOWARDS A WORKING MAN'S BUDGET WHO WANTS TO BUILD A STOUT, RELIABLE POWER PLANT FOR HIS HOT ROD, MUD TRUCK, OR EVEN GRASS ROOTS WEEKEND RACER. 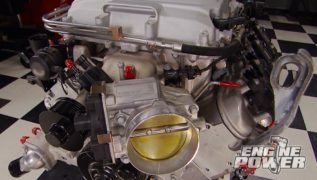 NOW THIS BUILD WILL NOT BREAK THE BANK, BUT IT WILL GET YOU A HIGH HORSEPOWER BULLET WITH A GREAT HORSEPOWER PER DOLLAR FIGURE. NATURALLY ASPIRATED FORM. 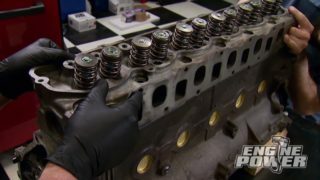 THESE SHORT BLOCKS CAN BE PURCHASED AS TAKE OUTS FOR A LITTLE LESS THAN $1,000 BUCKS WITH PLENTY OF LIFE LEFT IN THEM, OR YOU CAN FIND THEM REMANNED OR IN BASICALLY NEW FORM FOR A LITTLE UNDER $2,000, BUT EITHER WAY YOU GO YOU HAVE A GREAT PLATFORM FOR RELIABILITY AND IMPRESSIVE POWER. (MIKE)>> THE RECIPE FOR THAT IMPRESSIVE POWER STATEMENT PAT MENTIONED IS FAIRLY EASY TO COME UP WITH. WE HAVE A STOUT BOTTOM END FROM THE FACTORY THAT IS READY FOR A KILLER INDUCTION PACKAGE, AND IT'LL ALL FEED THE DYNO IN A LITTLE BIT. 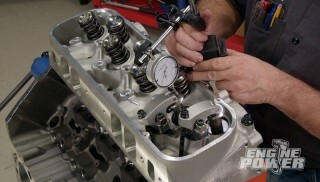 TRICK FLOW SPECIALTIES GENX 255 CYLINDER HEADS ARE THE MAIN COURSE. THEY HAVE A HEART SHAPED COMBUSTION CHAMBER THAT MEASURES IN AT 69cc. THE INTAKE VALVE IS TWO-165, AND THE EXHAUST VALVE IS AN INCH 600. NOW THEY'RE CNC MACHINED AND FLOW AN IMPRESSIVE 363 CFM AT SIX HUNDRED THOUSANDTHS LIFT. NOW WE'RE READY TO GET TO WORK. SO THE REST OF THESE PARTS WILL BE DISCUSSED AS THEY GO ON. THREESIX-22 STROKE, WHICH COMES OUT TO 364 CUBIC INCHES. NOW IN FACTORY TRIM THEY WERE RATED AT 300 HORSEPOWER AND 360 POUND FEET OF TORQUE. AND 238 ON THE EXHAUST. LOBE SEPARATION IS 113 DEGREES. NOW VALVE LIFT WITH A ONESEVEN RATIO ROCKER IS 625 ON BOTH THE INTAKE AND EXHAUST SIDE. POSITIONS TO HELP DIAL IN THE CAM EXACTLY WHERE YOU WANT IT. NOW THE DAMPENER IS INSTALLED, AND WE PUT THE TIMING TWO DEGREES ADVANCED. (PAT)>> WE'LL CHECK IT TO SEE WHERE THE INTAKE CENTER LINE IS LOCATED. 152 EQUALS, DIVIDED BY TWO. THE CAM COMES IN AT 109 DEGREES OF INTAKE CENTER LINE, WHICH IS FOUR DEGREES ADVANCED. WE PUT THE CRANK SPROCKET AT TWO DEGREES ADVANCED BUT IT ENDED UP BEING FOUR JUST BECAUSE OF STACK TOLERANCE, AND WE WANT THE CAM ADVANCED BECAUSE IT'S A STREET ENGINE AND WE WANT IT TO MAKE THE POWER DOWN LOW. SPACERS ARE USED TO POSITION THE PUMP ACCORDINGLY. WITH THE SHIMS IN FOR PROPER ALIGNMENT, THE PUMP IS TORQUED INTO PLACE. WE PAINTED THE TIMING COVER WITH VHT WRINKLE PLUS FOR A COOL LOOK. NOW THE STOCK WINDAGE TRAY IS LAID IN PLACE, AND THE OIL PICK UP IS POSITIONED AND TIGHTENED DOWN. TO CAP OFF THE BOTTOM END THE PAN IS SEATED ON THE GASKET AND SNUGGED DOWN AS WELL. AFTER THIS BREAK THE TRICK TOP END GOES TOGETHER. (PAT)>> WE'RE BACK AND READY TO STICK THE TOP END ON OUR WORKING MAN'S BULLET, AND WHEN WE GET IT ALL WRAPPED UP WE'RE GONNA SHARE WITH YOU THE DOLLAR AMOUNT AND THE HORSEPOWER PER DOLLAR AFTER WE FIND OUT HOW MUCH IT CRANKS OUT ON THE ENGINE DYNO, AND THE LAST THING WE'RE GONNA PUT IN OUR SHORT BLOCK ARE THESE NEW CHEVY PERFORMANCE HYDRAULIC ROLLER LIFTERS. WE SPEC'ED THESE 40 THOUSANDTHS THICK COMETIC MLS HEAD GASKETS SO OUR COMPRESSION RATIO IS A CALCULATED 10.13 TO ONE WITH ALL THE PARTS WE'RE USING. THESE GENX 255'S ARE KNOWN FOR MAKING GREAT POWER. TRICK FLOW DID A TON OF DEVELOPMENT WORK ON THE PORTS SO YOU DON'T HAVE TO TOUCH THEM. ARP HEAD BOLTS SECURE THEM DOWN AND ARE TORQUED TO 75 POUND FEET. NOW THE PUSH RODS CAN DROP IN. THESE ARE TRICK FLOW PIECES THAT MEASURE SEVEN-750 AND HAVE AN 80 THOUSANDTHS WALL THICKNESS. TO IMPROVE THE STRENGTH AND DURABILITY OF THE FACTORY ROCKER ARM WE'RE GONNA CHANGE OUT THE TRUNNIONS WITH AN UPGRADED TRUNNION KIT, WHICH ALSO ALLOWS FOR MORE ROCKER TRAVEL. BEARINGS ORIENTED CORRECTLY. PRESS THEM IN USING THE FLAT WASHERS. NOW INSTALL THE CCLIPS AND IT'S A DONE DEAL. ROCKERS ARE IN LINE. SUPPLIED FASTENERS WILL SECURE THEM. THEY'RE BOTH A FACTORY ONE POINT SEVEN RATIO. WE ALSO PAINTED THE VALVE COVERS WITH VHT'S WRINKLE PLUS. IT'S AN EASY AND VERY AFFORDABLE WAY TO DRESS UP AN ENGINE. SAME GOES FOR THE FACTORY VALLEY COVER. WITH COATINGS ON PERFORMANCE PARTS AS POPULAR AS EVER, HERE'S A LOOK AT HOW WE USE VHT'S WRINKLE PLUS. IT'S AN EASY WAY TO IMPROVE THE APPEARANCE ON AN ENGINE OR ANY CAR PART. WE HEAT THE PART EVENLY WITH A HEAT GUN UNTIL IT'S FAIRLY HOT TO THE TOUCH. THEN SPRAY ON A FEW COATS. NOW THIS STUFF HAS BEEN TESTED TO WITHSTAND TEMPS TO 350 DEGREES. ONCE THE SPRAYING IS COMPLETE, USE THE HEAT GUN TO CURE THE PRODUCT. THIS TAKES A COUPLE OF MINUTES. AS THE TEMPERATURE RISES, YOU'LL SEE IT CURE RIGHT BEFORE YOUR EYES. IT'S A SIMPLE AND VERY AFFORDABLE WAY TO GET A DISTINCTIVE CUSTOM FINISH. 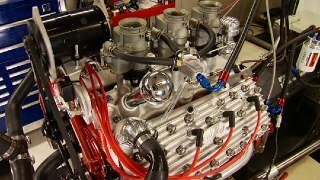 (PAT)>> THIS IS HOLLEY'S MID RISE LS THREE CARBURETED MANIFOLD. IT HAS AN OPERATING RANGE FROM 2,500 TO 7,000 RPM, AND A 41-50 SQUARE BORE FLANGE. PLUS AN OPTIMIZED RUNNER LAYOUT AND CONSISTENT CROSS SECTIONAL AREA. MSD COIL BRACKETS GO ON NEXT ALONG WITH MATCHING MSD COILS. THESE PROVIDE THREE TIMES THE CURRENT OF FACTORY COILS, WHICH HELPS IMPROVE THE COMBUSTION PROCESS OF THE FUEL MIXTURE. THEY PROVIDE MULTIPLE SPARKS AT IDLE RPM AND IMPROVED HIGH RPM OPERATION. ON THE FRONT OF THIS ENGINE THIS SUMMIT RACING SFI BALANCER IS GOING ON. IT IS DOUBLE RIBBED FOR NORMAL ACCESSORIES AND THE A/C BELT. 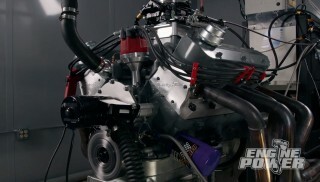 A MAZERE ELECTRIC WATER PUMP WILL KEEP THIS WORKING MAN'S BULLET COOL ON THE DYNO. 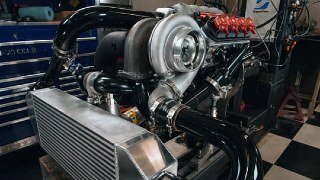 (MIKE)>> UP TOP ARE TRUSTY QUICK FUEL TECHNOLOGY'S BLACK DIAMOND 950 CFM FOUR BARREL CARBURETOR WILL FEED IT 93 OCTANE PUMP GAS. WHEN WE COME BACK THIS CLASSY LOOKING WORKING MAN'S BULLET WILL BE MATED TO THE DYNO AND READY FOR COMPLETION. 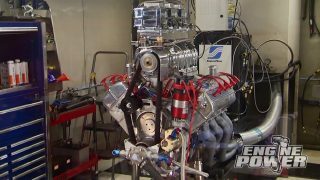 (MIKE)>> WE'RE IN THE DYNO ROOM AND REALLY CLOSE TO MAKING SOME NOISE, BUT FIRST WE WANT TO SHOW YOU A FEW CHANGES WE MADE IN HERE. NOW TO GIVE PAT AND I A LITTLE MORE ROOM TO WORK IN WE WENT AHEAD AND REMOVED THAT BIG BLUE TOOL BOX THAT WAS AGAINST THIS WALL AND PUT IT JUST OUTSIDE THE DOOR. NOW THAT GAVE US THE SPACE TO HANG THIS AWESOME PIT PALL ALUMINUM WORK TABLE THAT WE GOT FROM SUMMIT RACING. NOW THIS THING CAN BE USED IN THE RACE TRAILER, GARAGE, OR EVEN A SHED. THE COOL THING ABOUT IT, IT FOLDS FLAT DOWN AGAINST THE WALL FOR MORE SPACE SAVINGS WHEN NOT IN USE. (PAT)>> SUMMIT ALSO OFFERS THESE PIT PALL WALL ORGANIZERS, AND THESE ARE PERFECT FOR HANGING INSIDE YOUR ENCLOSED TRAILER DOOR OR EVEN RIGHT ON THE WALL, AND THEY ARE PERFECT FOR KEEPING YOUR FLUIDS AND YOUR PARTS IN ORDER, AND ANOTHER COOL THING ABOUT THEM IS THEY HAVE A FOLD DOWN TOOL TRAY, AND EVEN A PAPER TOWEL HOLDER. 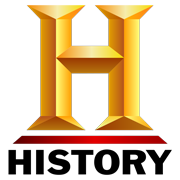 (MIKE)>> FOR HEADERS WE'RE USING A SET OF HOOKERS WITH INCH AND SEVENEIGHTHS PRIMARIES. THESE ARE A MID LENGTH DESIGN WITH A THREE INCH COLLECTOR. TO RUN A CARBURETOR ON AN LS ENGINE AN IGNITION CONTROLLER IS A MUST. THIS IS MSD'S SIX LS BOX THAT PLUGS INTO THE CRANK, CAM, AND COIL PACK CONNECTORS. A GROUND AND SWITCHED 12 VOLT IGNITION HOOK UP IS ALL IT NEEDS TO BE WIRED UP. THEY SUPPLY CHIPS WITH DIFFERENT TIMING CURVES OR YOU CAN USE THE SUPPLIED SOFTWARE AND A LAPTOP TO BUILD YOUR OWN, WHICH IS WHAT WE'RE DOING. THE SOFTWARE IS EASY TO USE. WE'RE PROGRAMMING 15 DEGREES OF TIMING DURING CRANKING, AND AT 800 RPM WE WILL PUT ANOTHER DOT AT 26 DEGREES AND CARRY THAT OUT TO 7,000 RPM. THIS IS BASICALLY LIKE LOCKING OUT A DISTRIBUTOR. NOW SEND THE TABLE TO THE MSD BOX AND IT'S DONE. 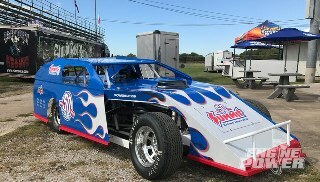 ALL RIGHT, THE WORKING MAN'S BULLET IS ALL HOOKED UP AND READY TO RUN ON THE DYNO. NOW THE COMPONENTS WE USED MADE FOR A SUPER SIMPLE INSTALLATION, AND HECK, WE EXPECT SOME PRETTY DECENT POWER OUT OF THIS THING. (PAT)>> THIS ENGINE FIRED UP IMMEDIATELY WITH ZERO ISSUES. AFTER A QUICK CHECK FOR LEAKS WE INCREASED THE RPM AND RAN THE ENGINE WITH SLIGHT LOAD FOR 15 MINUTES, MONITORING THE OIL PRESSURE AND THE WATER TEMP ALONG THE WAY. 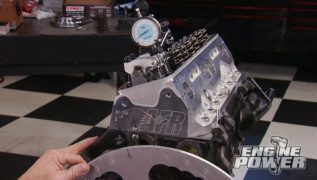 (MIKE)>> ALL RIGHT, THIS FIRST PULL JUST TO MAKE SURE EVERYTHING'S COOL, 2,500 TO 5,000 AT 450. (PAT)>> I LIKE IT! FEW THINGS RUN AS SMOOTH AS A WELL BUILT LS. ALL RIGHT, THAT IS NOT TOO BAD. EVERYTHING'S FINE, WE HAVEN'T FOUND ANY PEAKS YET, BUT 455 AT 5,000 AND 478 POUND FEET OF TORQUE. EVERYTHING'S GOING UP, EVERYTHING'S LOOKING GOOD. (MIKE)>> GOING UP IN BIG INTERVALS TOO. SO WE'LL INCREASE THE SWEEP AND GO FROM 3,500 TO 6,500 RPM. NICE AND SMOOTH! (PAT)>> MADE SOME GOOD POWER RIGHT THERE. (MIKE)>> WHOA, 540 HORSE, 483 POUND FEET. THIS THING HAS NOT FOUND PEAK YET AT 6,500. TORQUE DID PEAK AT 5,200. (PAT)>> THAT IS INCREDIBLE. THAT THING IS CALLED, IN THE ENGINE BUILDER'S WORLD, RUNNING ON CYLINDER HEAD. 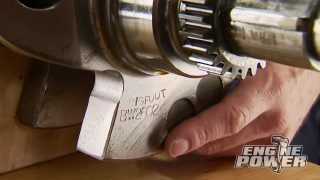 STEP IN THE SWEEP, THIS TIME 4,000 TO 7,000 RPM. (PAT)>> SWEET, WATCH THIS NUMBER. 548, 481 FOR TORQUE. STILL, I MEAN TORQUE'S DOWN JUST A TAD BIT BUT AGAIN FOR CONSISTENCY WISE THAT'S SUPER CLOSE, BUT IT MADE PEAK POWER AT? (PAT)>> THAT'S VERY, VERY IMPRESSIVE FOR. 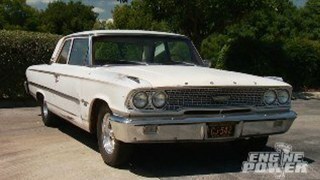 (MIKE)>> STOCK BOTTOM END SIX LITER. (PAT)>> MAN, THAT'S A TRUE TESTAMENT TO HOW GOOD PARTS ARE NOW DAYS. YOU'D KILL YOURSELF TRYING TO DO THIS 15, 20 YEARS AGO. (MIKE)>> 10.13 TO ONE ON COMPRESSION, WE'RE RUNNING 89 OCTANE. (PAT)>> 89 OCTANE, NOT EVEN PREMIUM, NOT EVEN 93. ALL RIGHT, SINCE WE'RE CARB GUYS AND WE'VE GOT A CARB ON IT, LET'S DO A SPACER ON IT. WE'LL DROP A ONE INCH SPACER ON TO SEE HOW IT EFFECTS OUR POWER CURVE, BUT NOT UNTIL AFTER THE BREAK, STAY WITH US! (MIKE)>> WE KNEW YOU'D HANG AROUND FOR THIS, AND PAT HAS A THEORY. (PAT)>> IT'S GONNA DO ONE OF THREE THINGS. IT'S GONNA MAKE MORE POWER, LESS POWER, OR IT'LL STAY THE SAME. I GUARANTEE IT'LL DO ONE OF THOSE THREE. (MIKE)>> ALL RIGHT, HERE WE GO. (PAT)>> THE SPACER INCREASES PLENUM VOLUME AND HELPS THE AIR MAKE A SMOOTHER TRANSITION INTO THE INTAKE RUNNER. OH I DON'T KNOW. (MIKE)>> LET'S SEE WHAT SHE CRANKED. (PAT)>> NOT BAD, 487 POUND FEET OF TORQUE. (MIKE)>> THESE TWO GRAPHS SHOW THE RUNS BEFORE AND AFTER THE ONE INCH SPACER. IT WAS WORTH 10 HORSEPOWER. (MIKE)>> IT PICKED UP ON BOTH SIDES. (PAT)>> YEP, DEFINITE IMPROVEMENT. LET'S SEE WHAT THE FUEL LOOKS LIKE. THE FUEL IS EFFECTED A LITTLE BIT AS FAR AS THIS AIR/FUEL RATIO, BUT IT PUT IT IN A NICE RANGE. IT'S GOT GREAT OIL PRESSURE. BOY, HOW'S THAT FOR A BOLT TOGETHER ENGINE? (MIKE)>> MAN I'LL TELL YOU WHAT. THIS WAS THE WORKING MAN'S BULLET AND RIGHT NOW IT'S MAKING ONE POINT FOURNINE HORSEPOWER PER CUBE ON A BONE STOCK BOTTOM END A LITTLE OVER 10 TO ONE. (PAT)>> THIS WORKING MAN'S BULLET SURPRISED US A LITTLE BIT ON HOW MUCH POWER IT MADE WITH THE PARTS THAT WERE IN IT. NOW IT HAS A GREAT POWER BAND, AND KEEP IN MIND IT RAN ON 89 OCTANE PUMP GAS. THE PARTS ADDED UP TO A LITTLE OVER $6,200 DOLLARS WITHOUT THE SHORT BLOCK. NOW THAT WORKS OUT TO AROUND $11 DOLLARS PER HORSEPOWER, WHICH IS PRETTY RESPECTABLE. NOW YOU CAN START OUT WITH A REMANNED SHORT BLOCK LIKE WE'VE DONE, OR GO A LITTLE BIT CHEAPER AND GET YOURSELF A GOOD RUNNING TAKE OUT AND DO THE MATH FROM THERE. 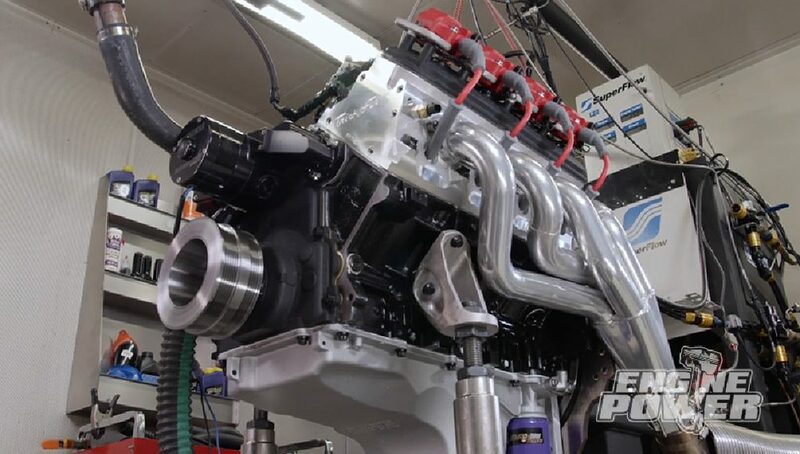 NOW SOME OF YOU ARE GONNA BE SAYING YOU CAN MAKE WAY MORE POWER FOR WAY CHEAPER BY TAKING A JUNKYARD ENGINE AND JUST POURING THE NITROUS OR TURBO TO IT, BUT LET ME TELL YOU YOU'RE LIVING ON BORROWED TIME. 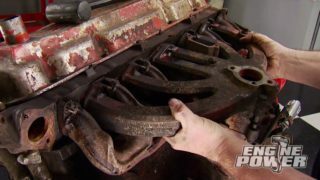 THIS ENGINE WILL BE DEAD RELIABLE AND GIVE YOU TROUBLE FREE HORSEPOWER FOR YEARS TO COME. REMEMBER THAT TUG BOAT OF A CAPRICE WE MODIFIED? WELL WE HAVE A FINAL UPDATE FOR YOU, BUT FIRST HERE'S HOW IT STARTED. (MIKE)>> LAST YEAR WE STARTED A PROJECT CALLED "GRAY HAIR, WHITE KNUCKLE" JUST TO SEE HOW MUCH PERFORMANCE WE COULD GET FROM THIS 4,000 POUND BEHEMOTH. LIGHTENING IT UP WAS NOT OUR GOAL. WE REPLACED THE STOCK REAR END, STARTING WITH YUKON GEAR AND AXLE PARTS, ALL LOADED IN A BULLETPROOF EIGHT AND A HALF 10 BOLT REAR END. STUFFED IN AN 816 HORSEPOWER LSA WE BUILT... ( )>> WE HOME FREE BABY! (MIKE)>> ...AND A SIX SPEED AUTOMATIC TRANSMISSION, AND WE FIRED IT UP, AND WITH A PERFORMANCE SHIFTER, PLUS A UNIQUE WHEEL AND TIRE COMBO, THIS BOAT ROLLED OUT ON ITS OWN POWER, BUT STILL HAD SOME LOOSE ENDS TO ADDRESS, UNTIL TODAY. IT'S OFF FOR THE MAIDEN VOYAGE TO THE NATIONAL CORVETTE MUSEUM'S ROAD COURSE. GREAT WEATHER, GREAT TRACK, GREAT COPILOT. (PAT)>> WOW, I LIKE THAT! 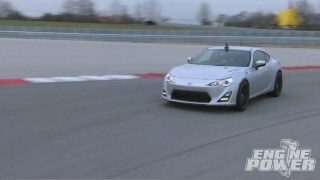 (MIKE)>> I JUMPED BEHIND THE WHEEL FIRST. PAT LET ME HAVE THE HONORS FOR SOME UNKNOWN REASON. RIGHT AWAY YOU COULD FEEL THE WEIGHT OF THIS CAR AND THE IMMENSE AMOUNT OF TORQUE AND POWER THIS ENGINE HAS TO HANDLE IT. IT HAS AMAZING ACCELERATION, AND PULLS THIS CAPRICE AROUND THE TURNS AT A VERY SURPRISING SPEED. WHEN NOT IN CONTROL IN THE DRIVER'S SEAT, SOMETIMES COPILOTS CAN DEVELOP MOTION SICKNESS, AND THE DRIVER TENDS TO EXPLOIT THAT FOR A LITTLE MORE SEAT TIME. THAT GAVE ME SOME EXTRA TIME TO PUT THE CAR THROUGH IT'S PACES AND GET AS MUCH FEEDBACK FROM IT AS I COULD. YOU QUICKLY LEARN ITS PERSONALITY. SELL IT, BUT FOR RIGHT NOW WE'RE GOING TO SIT ON IT. 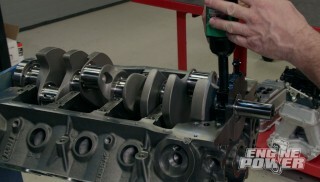 KNOWING THE POSITION OF THE CAM'S INTAKE CENTER LINE IS CRITICAL IN ANY BUILD. DEGREEING TOOLS INCLUDE A DEGREE WHEEL, A DECK BRIDGE WITH DIAL INDICATOR, PISTON STOP, AND A LOBE LIFT TOOL THAT FITS INSIDE A LIFTER BORE, AND LAST BUT NOT LEAST CLEANERS AND LUBES. WE HAVE LACQUER THINNER FOR CLEANING PARTS, EXTREME PRESSURE LUBE FOR HIGH WEAR SURFACES AREAS, ARP ULTRA TORQUE TO KEEP OUR TORQUE VALUES CONSISTENT, AND A CAN OF OIL FOR ALL OTHER WEAR SURFACES, AND NOW YOU KNOW.